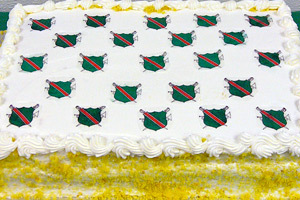 Each March, the Santa Clara Vanguard organization gathers to celebrate the anniversary of its "birth." In 2010, it landed on the weekend of March 27, which coincided with the organization's World and Open Class corps camps and rehearsals for the Santa Clara Vanguard Cadets Winter Percussion and Santa Clara Vanguard Independent World Guard. The percussion unit, in its first year of existence, used Rachmaninoff's "Prelude in C Sharp Minor" as the basis for its show, The Prelude. The group's undefeated competitive season recently wrapped up at the California Color Guard Championships in San Jose and with an evening performance in Ceres, Calif. The corps' winter guard, also undefeated this season, is Dayton, Ohio-bound to defend its 2009 Winter Guard International World Championship title this weekend. Tucked away in the James Lick High School Library, a collection of Santa Clara Vanguard parents, staff, and boosters gathered early Saturday morning for their monthly meeting. While the corps practiced nearby, Team SCV was treated to updates from Board President Marc Hebert. "For the first time," he explained, "the organization has two off-season units. Both are doing very well and are not only building momentum for the summer, but visibility in the community." Hebert explained how this begins to fulfill the organization's new mission statement: Be the recognized leader in music and movement education for young people in Silicon Valley. By working on a community presence, the Vanguard hopes to fill the music education gap created as a consequence of budget cuts throughout the state. Meeting participants were then invited to "Miss Amana," the SCV food trailer, to partake in a potato/salad bar lunch with A-corps members. Quickly finished, drum majors Ronny Sunnaa and Christopher Craig paused a moment to chat. Sunnaa, 18, is in his third year with the corps. He will be the principle drum major assisted by Craig, 21. Both played horns - baritone and trumpet respectively - prior to being tapped for the leadership positions. "One of our expectations this year is to be remembered as one of the outstanding SCV corps," said Sunnaa. "To build on the progress of last year," added Craig. "Build on the traditions." While both corps continued to rehearse just a few miles from Vanguard Hall, an afternoon concert with the Silicon Valley Brass Band (SVBB) kicked off Sunday's activities. 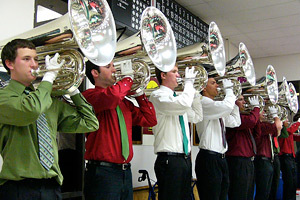 SVBB, a traditional English brass band, performed a variety of songs from composer John W.N. Palmer, opened with a SCV favorite "Procession of the Nobles" and ended with "Birdland." 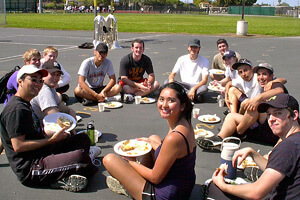 Composed of local musicians, the band featured a number of SCV alums with long drum corps pedigrees. A few hours later, the doors opened at the corps hall and the 43rd anniversary fun began. Guests dined on spaghetti topped with "special" sauce created from corps founder Gail Royer's recipe, entered in raffles, bid on silent auction items, applauded those recognized for outstanding service, and heard a preview of the corps' 2010 programs. Among those receiving accolades was A-corps bass drummer Jacob Kosarchuk, 20, who earned the 2010 Paul Seibert Legacy Award. Presenter J.W. Koester, tour manager and former SCV director, spoke fondly of Seibert saying, "Until 1975, Paul was the drum line. He created the attitude that said 'we are the best' and led our lines to 56 undefeated shows and three drum titles." Seibert passed away in 2007, and corps alumni created a scholarship in his memory. Winner of the first Santa Clara Vanguard/San Jose State Scholarship was Angelique Sayson, 18, who performs in the front ensemble with the A-corps, Vanguard Cadets Winter Percussion and the San Jose State University Marching Band. Sayson received high praise by her mentors including SCV pioneer alum and San Jose State Band Director Scott Pierson, who called her "a rock of a performer." And evidently quite dedicated as she was unable attend the proceedings due to a rehearsal. Winding down the evening were performances by both summer units. Under the direction of new Vanguard Cadets Director Robert Nieves and the baton of Andre Garcia, 19, the Vanguard Cadets played the first two movements of their show, "Chakra" while overhead monitors displayed classic SCV moments. Garcia, a tuba player in 2008, is excited that this year's corps is fielding eight tubas. Between corps, Board President Herbert spoke of SCV entering a "golden-age" with nods to Fielder for "introducing new paradigms." In turn Fielder gave some enlightening statistics. With a focus on going local, a staggering 100 of the 150 A-corps members hail from California; a good sign the corps is mindful of its new mission statement. "Let Freedom Ring," an Americana tune, will be the World Class corps' patriotic choice during Fourth of July festivities, while "Londonderry Air" (Danny Boy) will be their ongoing homage to one of DCI's founding fathers, 27th Lancers Director George Bonfiglio, who passed away in March. Bonfiglio's daughter, Denise, has been a Vanguard staff member and consultant for many years. In attendance that night was Terry Keenan, a local supporter who appreciated hearing the song, harkening back to his own days as a member of the 27th Lancers. After selections from the A-corps' 2010 program, "Bartók," which is based on works from the Hungarian composer, the evening ended with a performance of "Send in the Clowns." Mellophone player Erin Holtz, an age-out member with five years under her belt, rendered melodic solos for both the opening piece of "Bartók" and the corps' signature tune. When asked how the Boise, Idaho native earned a solo opportunity, she said smiling, "I raised my hand at the auditions." View a photo gallery from Santa Clara Vanguard's anniversary weekend.